The global market for commercial avionics systems features a highly consolidated vendor landscape, with the top four companies, namely Honeywell Aerospace, Garmin Ltd., Thales Group, and Rockwell Collins, cumulatively holding nearly 77% of the market in 2015, observes Transparency Market Research in a recent report. The highly competitive market is expected to become further competitive in the next few years as the leading companies focus more on the development of innovative and technologically advanced systems. Low cost of entry into carrier systems is expected to lead to emergence of a number of new players in the near future. Transparency Market Research estimates that the global commercial avionics systems market will exhibit a CAGR of 3.5% over the period between 2016 and 2024, rising from a worth of US$25.34 bn in 2016 to US$31.07 bn by 2024. 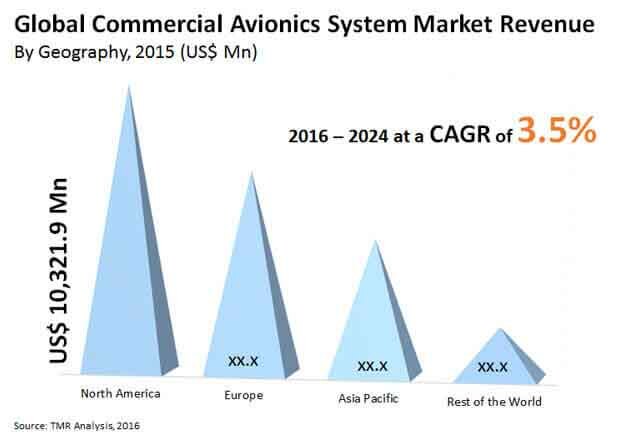 In terms of type of commercial avionics systems, the segment of navigation systems is expected to account for a dominant share in the revenue of the global commercial avionics systems over the report's forecast period. The leading share of the segment in the global market will be attributed to the increased use of flight management systems, multi-mode receivers, and GPS in commercial aircrafts, which require the presence of refined navigation systems for proper operation. In terms of geography, the market in North America accounted for a massive share of 42.4% of the global market in 2015 and the region is expected to retain dominance over the report's forecast period as well. Willingness of aviation companies to spend on technological advancements and an improved state of economic development are expected to help the regional market witness strong growth in the near future. One of the key factors boosting the growth prospects of the global commercial avionics systems market is the rapid rate of technological advancement in the aviation industry. Introduction of innovations such as glass cockpit, vast improvements in in-flight entertainment systems, and the increased demand for real-time data analytics from aviation companies are also expected to provide massive room for growth for companies operating in the global commercial avionics systems market. The demand for real-time data analytics is especially more prominent in developed regions such as Europe and North America as the aviation industry is well-established and capable of seamlessly incorporate advanced technologies. Modern avionics systems have the risk of falling prey to cyber-attacks, bringing a severe threat to the security of an aircraft. This concern is one of the key challenges affecting the overall adoption of advanced commercial avionics systems. The factor has been especially proven to be very restrictive for the development of the market in developed economies after several high-profile terrorist attacks have occurred in the past few decades. Moreover, the high cost of advanced systems also deter their adoption to a certain level across cost-sensitive emerging nations, posing a significant threat to the overall profitability of the global market. This review of the global commercial avionics systems market is based on a recent market research report by Transparency Market Research, titled " Commercial Avionics Systems Market (Systems - Integrated Modular Avionics, Avionics Full Duplex Switched Ethernet, Surveillance Systems, Cockpit Systems, Cabin Systems, Flight Control and Emergency System, Navigation Systems, Electrical Systems, Communication Systems, and Central Maintenance Systems; Aircraft Types - Fixed Wing Aircrafts and Rotary Wing Aircrafts) - Global Industry Analysis, Size, Share, Growth, Trends and Forecast 2016 - 2024."